The Great Society was a set of domestic programs proposed or enacted in the United States on the initiative of President Lyndon B. Johnson (1963-1969). Two main goals of the Great Society social reforms were the elimination of poverty and racial injustice. New major spending programs that addressed education, medical care, urban problems, and transportation were launched during this period. The Great Society in scope and sweep resembled the New Deal domestic agenda of Franklin Roosevelt, but differed sharply in types of programs. Some Great Society proposals were stalled initiatives from John F. Kennedy's New Frontier. Johnson's success depended on his own remarkable skills at persuasion, coupled with the Democratic landslide in 1964 that swept many new liberals in Congress. Anti-war Democrats complained that spending on the Vietnam War choked off the Great Society. While some of the programs have been eliminated or have had their funding reduced, many of them, including Medicare, Medicaid, and federal education funding, continue to the present. The most controversial component, the "War on Poverty," led to the creation of welfare programs that conservatives believed were responsible for creating a permanent underclass by removing the incentive to work. So, too, the example of Cabrini-Green in Chicago has demonstrated that public housing programs can only succeed when it allows the tenants to take responsibility to manage their own affairs. Unlike the New Deal, which was a response to a severe economic crisis, the Great Society emerged in a period of prosperity. President Kennedy had proposed a tax cut, which was enacted in February 1964, three months after his death. Gross National Product rose 10 percent in the first year of the tax cut, and economic growth averaged a rate of 4.5 percent from 1961 to 1968. Disposable personal income rose 15 percent in 1966 alone. Despite the drop in tax rates, federal revenues increased dramatically from $94 billion in 1961 to $150 billion in 1967. As the Baby Boom generation aged, two and a half times more Americans would enter the labor force between 1965 and 1980 than had between 1950 and 1965. Grave social crises confronted the nation. Racial segregation persisted throughout the South, despite the Montgomery bus boycott, Brown v. Board of Education and other efforts of the Civil Rights Movement. In 1964 urban riots began within black neighborhoods in New York City and Watts in Los Angeles. President Kennedy had employed several task forces comprised of scholars and experts to craft New Frontier legislation and to deal with foreign affairs. The reliance on experts appealed to Johnson, in part because the task forces would work in secret and outside of the existing governmental bureaucracy and directly for the White House staff. Almost immediately after the Ann Arbor speech, 14 separate task forces began studying nearly all major aspects of United States society under the guidance of presidential assistants Bill Moyers and Richard N. Goodwin. The average task force had nine members, and generally was comprised of governmental experts and academicians. Only one of the Task Forces on the 1965 Legislative Program addressed foreign affairs (Foreign economic policy); the rest were charged with domestic policy (Agriculture, Anti-recession policy, Civil rights, Education, Efficiency and economy, Health, Income maintenance policy, Intergovernmental fiscal cooperation, Natural resources, Pollution of the environment, Preservation of natural beauty, Transportation, and Urban problems). After task force reports were submitted to the White House, Moyers began a second round of review. The recommendations were circulated among the agencies concerned and were evaluated by new committees comprised mostly of government officials. Johnson was particularly concerned with experts on relations with Congress were also drawn into the deliberations to get the best advice on persuading the Congress to pass the legislation. In late 1964 Johnson reviewed these initial Great Society proposals at his ranch with Moyers and Budget Director Kermit Gordon. Many of them were included in Johnson’s State of the Union address delivered on January 7, 1965. The task-force approach, combined with Johnson's electoral victory in 1964 and his talents in obtaining congressional approval, were widely credited with the success of the legislation agenda in 1965. Critics would later cite the task forces as a factor in a perceived elitist approach to Great Society programs. Also, because many of the initiatives did not originate from outside lobbying, some programs had no political constituencies that would support their continued funding. Historian Alan Brinkley has suggested that the most important domestic achievement of the Great Society may have been its success in translating some of the demands of the civil rights movement into law. Four civil rights acts were passed, including three laws in the first two years of Johnson's presidency. The Civil Rights Act of 1964 forbade job discrimination and the segregation of public accommodations. The Voting Rights Act of 1965 assured minority registration and voting. It suspended use of literacy or other voter-qualification tests that had sometimes served to keep African-Americans off voting lists and provided for federal court lawsuits to stop discriminatory poll taxes. It also reinforced the Civil Rights Act of 1964 by authorizing the appointment of federal voting examiners in areas that did not meet voter-participation requirements. The Immigration and Nationality Services Act of 1965 abolished the national-origin quotas in immigration law. The Civil Rights Act of 1968 banned housing discrimination and extended constitutional protections to Native Americans on reservations. The most ambitious and controversial part of the Great Society was its initiative to end poverty. The Kennedy administration had been contemplating a federal effort against poverty. Johnson, who as a teacher had observed extreme poverty in Texas among Mexican-Americans, launched an "unconditional war on poverty" in the first months of his presidency with the goal of eliminating hunger and deprivation from American life. The centerpiece of the War on Poverty was the Economic Opportunity Act of 1964, which created an Office of Economic Opportunity (OEO) to oversee a variety of community-based anti-poverty programs. The OEO reflected a fragile consensus among policymakers that the best way to deal with poverty was not simply to raise the incomes of the poor but to help them better themselves through education, job training, and community development. Central to its mission was the idea of "community action," the participation of the poor themselves in framing and administering the programs designed to help them. The War on Poverty began with a $1 billion appropriation in 1964 and spent another $2 billion in the following two years. It spawned dozens of programs, among them the Job Corps, whose purpose was to help disadvantaged youth develop marketable skills; the Neighborhood Youth Corps, the first summer jobs established to give poor urban youths work experience and to encourage them to stay in school; Volunteers in Service to America (VISTA), a domestic version of the Peace Corps, which placed concerned citizens with community-based agencies to work towards empowerment of the poor; the Model Cities Program for urban redevelopment; Upward Bound, which assisted poor high school students entering college; legal services for the poor; the Food Stamps program; the Community Action Program, which initiated local Community Action Agencies charged with helping the poor become self-sufficient; and Project Head Start, which offered preschool education for poor children. The most important educational component of the Great Society was the Elementary and Secondary Education Act of 1965, designed by Commissioner of Education Francis Keppel. It was signed into law on April 11, 1965, less than three months after it was introduced. It ended a long-standing political taboo by providing significant federal aid to public education, initially allotting more than $1 billion to help schools purchase materials and start special education programs to schools with a high concentration of low-income children. The Act established Head Start, which had originally been started by the Office of Economic Opportunity as an eight-week summer program, as a permanent program. The Higher Education Act of 1965 increased federal money given to universities, created scholarships and low-interest loans for students, and established a National Teachers Corps to provide teachers to poverty stricken areas of the United States. It began a transition from federally-funded institutional assistance to individual student aid. The Bilingual Education Act of 1968 offered federal aid to local school districts in assisting them to address the needs of children with limited English-speaking ability until it expired in 2002. The Social Security Act of 1965 authorized Medicare and provided federal funding for many of the medical costs of older Americans. The legislation overcame the bitter resistance, particularly from the American Medical Association, to the idea of publicly-funded health care or "socialized medicine" by making its benefits available to everyone over sixty-five, regardless of need, and by linking payments to the existing private insurance system. In 1966 welfare recipients of all ages received medical care through the Medicaid program. Medicaid was created on July 30, 1965 through Title XIX of the Social Security Act. Each state administers its own Medicaid program while the federal Centers for Medicare and Medicaid Services (CMS) monitors the state-run programs and establishes requirements for service delivery, quality, funding, and eligibility standards. In September 1965, Johnson signed the National Foundation on the Arts and Humanities Act into law, creating both the National Endowment for the Arts and National Endowment for the Humanities as separate, independent agencies. Lobbying for federally funded arts and humanities support began during the Kennedy Administration. In 1963 three scholarly and educational organizations — the American Council of Learned Societies (ACLS), the Council of Graduate Schools in America, and the United Chapters of Phi Beta Kappa — joined together to establish the National Commission on the Humanities. In June 1964 the commission released a report that suggested that the emphasis placed on science endangered the study of the humanities from elementary schools through postgraduate programs. In order to correct the balance, it recommended "the establishment by the President and the Congress of the United States of a National Humanities Foundation." In August 1964, Congressman William Moorhead of Pennsylvania proposed legislation to implement the commission's recommendations. Support from the White House followed in September, when Johnson lent his endorsement during a speech at Brown University. In March 1965, the White House proposed the establishment a National Foundation on the Arts and Humanities and requested $20 million in start-up funds. The commission's report had generated other proposals, but the White House's approach eclipsed them. The administration's plan, which called for the creation of two separate agencies each advised by a governing body, was the version approved by Congress. Richard Nixon later dramatically expanded funding for NEH and NEA. After the First National Conference on Long-Range Financing of Educational Television Stations in December 1964 called for a study of the role of noncommercial education television in society, the Carnegie Corporation agreed to finance the work of a 15-member national commission. Its landmark report, Public Television: A Program for Action, published on January 26, 1967, popularized the phrase "public television" and assisted the legislative campaign for federal aid. The Public Broadcasting Act of 1967, enacted less than 10 months later, chartered the Corporation for Public Broadcasting as a private, non-profit corporation. The law initiated federal aid through the CPB for the operation, as opposed to the funding of capital facilities, of public broadcasting. The CPB initially collaborated with the pre-existing National Educational Television system, but in 1969 decided to start the Public Broadcasting Service (PBS). A public radio study commissioned by the CPB and the Ford Foundation and conducted from 1968-1969 led to the establishment of National Public Radio, a public radio system under the terms of the amended Public Broadcasting Act. Two long-planned national cultural and arts facilities received federal funding that would allow for their completion through Great Society legislation. A National Cultural Center, suggested during the Franklin D. Roosevelt Administration and created by a bipartisan law signed by Dwight Eisenhower, was transformed into the John F. Kennedy Center for the Performing Arts, a living memorial to the assassinated president. Fundraising for the original cultural center had been poor prior to legislation creating the Kennedy Center, which passed two months after the president's death and provided $23 million for construction. The Kennedy Center opened in 1971. In the late 1930s the United States Congress mandated a Smithsonian Institution art museum for the National Mall, and a design by Eliel Saarinen was unveiled in 1939, but plans were shelved during World War II. A 1966 act of Congress established the Hirshhorn Museum and Sculpture Garden as part of the Smithsonian Institution with a focus on modern art, in contrast to the existing National Art Gallery. The museum was primarily federally funded, although New York financier Joseph Hirshhorn later contributed $1 million toward building construction, which began in 1969. The Hirshhorn opened in 1974. The most sweeping reorganization of the federal government since the National Security Act of 1947 was the consolidation of transportation agencies into a cabinet-level Department of Transportation. The department was authorized by Congress on October 15, 1966 and began operations on April 1, 1967. The Urban Mass Transportation Act of 1964 provided $375 million for large-scale urban public or private rail projects in the form of matching funds to cities and states and created the Urban Mass Transit Administration (now the Federal Transit Administration). The National Traffic and Motor Vehicle Safety Act of 1966 and the Highway Safety Act of 1966 were enacted, largely as a result of Ralph Nader's book Unsafe at Any Speed. In 1964 Johnson named Assistant Secretary of Labor Esther Peterson to be the first presidential assistant for consumer affairs. Cigarette Labeling Act of 1965 required packages to carry warning labels. Motor Vehicle Safety Act of 1966 set standards through creation of the National Highway Traffic Safety Administration. The Fair Packaging and Labeling Act required products identify manufacturer, address, clearly marking quantity and servings. Statute also authorizes permits HEW and FTC to establish and define voluntary standard sizes. The original would have mandated uniform standards of size and weight for comparison shopping, but the final law only outlawed exaggerated size claims. The Child Safety Act of 1966 prohibited any chemical so dangerous that no warning can make its safe. The Flammable Fabrics Act of 1967 set standards for children's sleepwear, but not baby blankets. The Wholesome Meat Act of 1967 required inspection of meat which must meet federal standards. The Truth-in-Lending Act of 1968 required lenders and credit providers to disclose the full cost of finance charges in both dollars and annual percentage rates, on installment loan and sales. The Wholesome Poultry Products Act of 1968 required inspection of poultry which must meet federal standards. The Land Sales Disclosure Act of 1968 provided safeguards against fraudulent practices in the sale of land. The Radiation Safety Act of 1968 provided standards and recalls for defective electronic products. National Environmental Policy Act of 1969. Several observers have noted that funding for many Great Society programs, particularly the poverty initiatives, became difficult beginning in 1968, chiefly due to the Vietnam War and Johnson's desire to maintain a balanced budget. Many Great Society initiatives, especially those that benefited the middle class, continue to exist in some form. Civil rights laws remain on the books in amended versions. Some programs, like Medicare and Medicaid, have been criticized as inefficient and unwieldy, but enjoy wide support and have grown considerably since the 1960s .Retrieved February 8, 2008. Federal funding of public and higher education has expanded since the Great Society era and has maintained bipartisan support. Federal funding for culture initiatives in the arts, humanities, and public broadcasting have repeatedly been targets for elimination, but have survived. The actual impact of the War on Poverty remain widely debated. The Office of Economic Opportunity was dismantled by the Nixon and Ford administrations, largely by transferring poverty programs to other government departments. Funding for many of these programs were further cut in President Ronald Reagan's first budget in 1981. On the positive side one of Johnson's aides, Joseph A. Califano, Jr., argued that, "from 1963 when Lyndon Johnson took office until 1970 as the impact of his Great Society programs were felt, the portion of Americans living below the poverty line dropped from 22.2 percent to 12.6 percent, the most dramatic decline over such a brief period in this century." The poverty rate for blacks fell from 55 percent in 1960 to 27 percent in 1968.. However, the poverty rate among black families fell dramatically from 1940 and 1960 (87 percent to 47 percent), suggesting poverty rates would have continued falling without the War on Poverty. However, as Alan Brinkley has suggested, the gap between the expansive intentions of the War on Poverty and its relatively modest achievements fueled later conservative arguments that government is not an appropriate vehicle for solving social problems. The poverty programs were heavily criticized by conservatives like Charles Murray, who denounced them in his 1984 book Losing Ground as ineffective and creating a permanent underclass of citizens that subsisted on welfare. During the Clinton Administration, the Republican led Congress passed the Welfare Reform Act of 1996, which replaced the key welfare program, Aid to Families with Dependent Children (AFDC) with Temporary Assistance for Needy Families (TANF). Although roundly denounced by liberal groups in 1996, the bill was followed by a reduction in unemployment. The New Republic opined"A broad consensus now holds that welfare reform was certainly not a disaster—and that it may, in fact, have worked much as its designers had hoped." Irving Kristol and other critics of Great Society programs founded a politics and culture journal The Public Interest in 1965. While most of these critics had been anti-communist liberals, their writings were skeptical of the perceived social engineering of the Great Society. Often termed neoconservatives, they are credited with laying the groundwork for the conservative movement of the 1980s and 1990s. 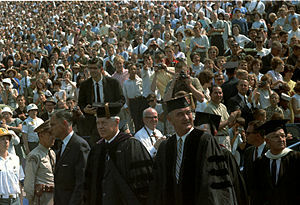 ↑ President Johnson's speech at the University of Michigan from the LBJ Library.www.lbjlib.utexas.edu. ↑ Irwin Unger. 1996. The Best of Intentions: the triumphs and failures of the Great Society under Kennedy, Johnson, and Nixon. (New York: Doubleday), 104. ↑ James Crawford .Obituary. "The Bilingual Edication Act 1968-2002." Retrieved February 8, 2008. ↑ . "The Social Secutiry Act Amendments. "Retrieved February 8, 2008. ↑ . "How NEH got its start" www.neh.gov. Retrieved February 8, 2008. ↑ . "Return to Camelot: Music of the Kennedy Years." www.wosu.org.Retrieved February 8, 2008. ↑ . "The Hirshhorn Story: Timeline." www.hirshhorn.si.edu.Retrieved February 8, 2008. ↑ . "The United States Department of Transportation: A Brief History. "Retrieved February 8, 2008. ↑ Joseph A. Califano, Jr. . "What Was Really Great About The Great Society? - The truth behind the conservative myths" October 1999, www.washingtonmonthly.com.Retrieved February 8, 2008. ↑ . "Harris Poll Finds Public Support for Medicare, Medicaid, Other Health Care Programs, USA" www.medicalnewstoday.com. ↑ Digital History, Univ. of Houston, Ed. Dept.. The Tumultous 1960s: "The Great Society and the Drive for Black Equality" www.digitalhistory.uh.edu. Retrieved February 8, 2008. ↑ Thomas Sowell . Jewish World Review Sept. 28, 2000 /28 Elul, 5760, www.jewishworldreview.com.Retrieved February 8, 2008. ↑ Francis Fukuyama, America at the Crossroads: Democracy, Power, and the Neoconservative Legacy. (Yale University Press, 2006, ISBN 0300113994), 18-19. Milkis, Sidney M. and Jerome M. Mileur, eds. The Great Society and The High Tide Of Liberalism. 2005. This page was last modified on 14 July 2017, at 22:17.